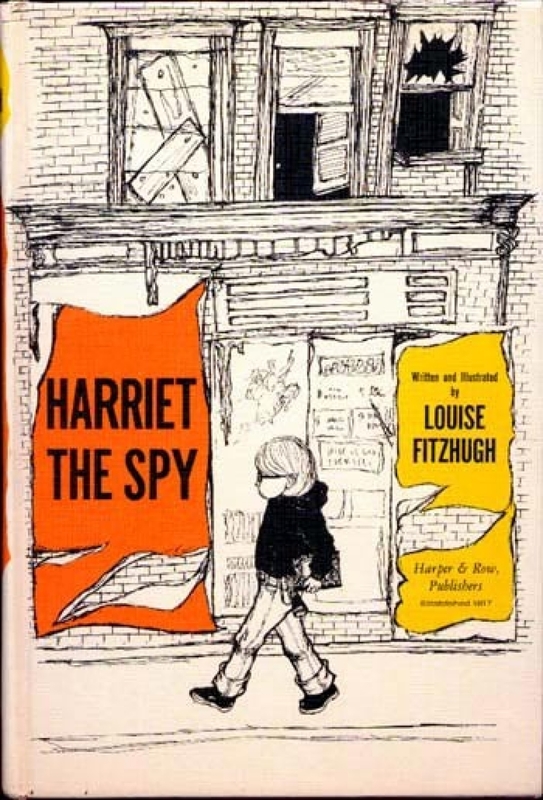 Eleven-year-old Harriet is a spy. She wanders around Manhattan, peeking in windows and listening at doors, and writing everything down in her notebook. Her observations about everyone, strangers and friends alike, are brutally honest and laced with sharp wit. When disaster strikes and her notebook falls into the hands of her classmates her entire life seems to come crashing down. Even her best friends Sport and Janie turn against her once they’ve read what she’s written about them. Her entire class has declared war on her, and Harriet is all alone, doubly so since her beloved nanny Ole Golly has recently left to get married. Ole Golly told her she was old enough to make her decisions, but Harriet isn’t so sure. As the bullying at school becomes more acute, Harriet grows depressed and uncommunicative, and her parents have no idea what to do with her. (Familiar adolescent territory!) Finally a letter from Ole Golly sets Harriet back on the right path. Armed with her good advice Harriet does her best to patch up things with her two best friends and take the next steps in her writing career. Harriet the Spy brilliantly reveals the thoughts and feelings of a precocious preteen as she goes through some really difficult social situations and learns to negotiate her own way in the world. The main cause of Harriet’s troubles is her unsparingly critical opinion of everyone around her, though this is also an essential ingredient of her creativity. While she is just as acerbic at the end of the book as she is at the beginning, she does begin to see the world through the eyes of the strangers she observes, and feels sympathy for them – the first great accomplishment in her quest to become a writer. This novel is rightly regarded as a literary classic, an honest story about a very bright and creative preteen going through difficult times. Today smart-alecky social misfits appear regularly in middle grade fiction, but in 1964 they were a rare breed. The book received glowing reviews when it was published, but there were also many who objected to the heroine talking back to adults, cursing (in a mild, 1960s way), and spying on people – peering in windows, sneaking around rooftops, even entering a house and hiding in a dumbwaiter. There have been a few school bans and challenges over the years because of this ‘bad example’. While it is true that she behaves pretty atrociously at times, this is exactly what causes readers to identify so strongly with her. Another revolutionary element to this book is how the characters challenge gender stereotypes, again a pretty daring position for that era. The author Louise Fitzhugh was a lesbian, and while Harriet does not display any romantic inclinations whatsoever (other than declaring matter-of-factly that she will marry her male friend Sport when she grows up), she resolutely dresses in boys’ clothes and is definitely a social outsider. As well, Sport does all the cooking and cleaning in his single parent home, which again was pretty unusual for boys in books at that time. This was before the tremendous social upheaval of the late 1960s, and conventions regarding hair, fashion and conduct were still extremely restrictive. (Remember this was when the Beatles’ haircuts were considered extremely daring!) Into this era strode Harriet the Spy, vehemently championing the right of every child to be who they are, despite the pressures of parents, teachers or peers. No wonder this novel is still beloved by so many readers, even after fifty-three years. Absolutely! I just read it again and it’s aged well! Still sharp, heartbreaking, and above all, funny.